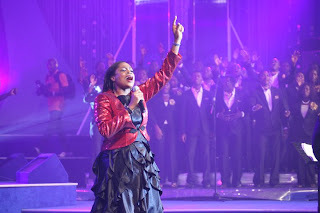 Sinach is a key member of the LoveWorld music team of Christ Embassy who started singing at a very young age. However, it was not until she met the man of God, Pastor Chris Oyakhilome, that she knew that she was called and then began her training towards using her talent for ministry. For over fifteen years Sinach has been privileged to witness, first hand, amazing miracles take place in the lives of people while ministering in music, as her mentor Pastor Chris ministered in the Healing School, several crusades, and conventions all over the world. The title of this song is Awesome God; it's off of the Chapter One album which was released about two years or so ago. I hope this song blesses you as much as it has blessed me.